I'm sure you've already heard... it's the LAST DAY of the Nordstrom Anniversary Sale. 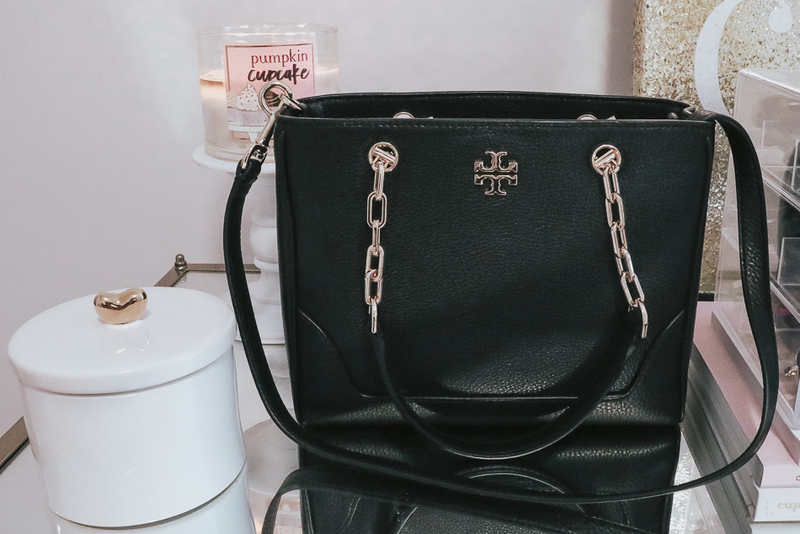 I thought I'd share a couple of items that are still in stock, specifically my new Tory Burch Small Marsden Leather Tote. It's been one of the most popular items on Pardon Muah and for good reason! It's high-quality, a nice supple leather, small enough to take everywhere, and big enough to fit all the essentials. Speaking of which, I thought I would share those too! 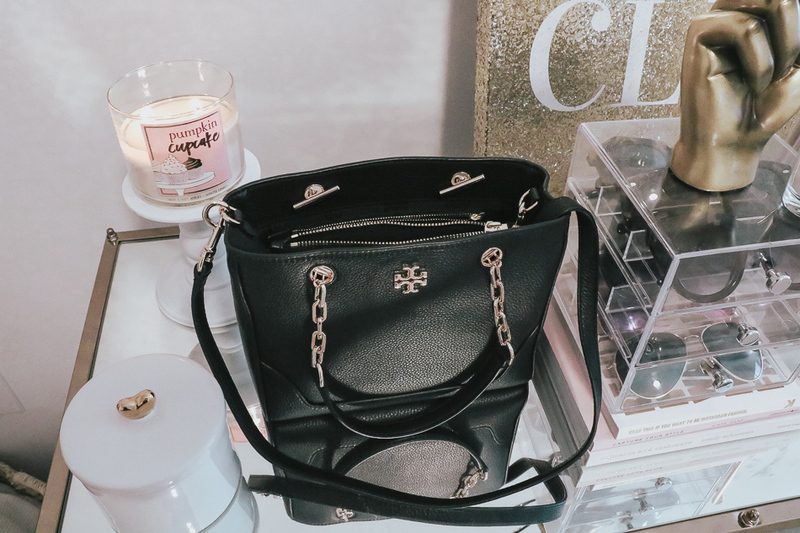 Continue reading to find out what's in my bag. 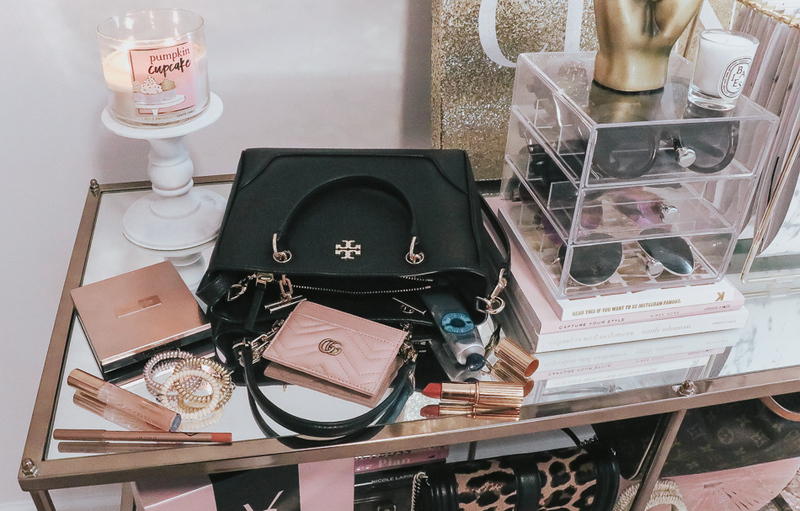 And if you'd like to see what's still in stock for clothing you can check out my Nordstrom Anniversary Sale Try-On... and plenty of other sale posts at the end of this one! Lately, I've been using my Gucci Marmont Card Case constantly. It took me a while because I was so scared I would get it dirty but now I'm totally obsessed and always take it with me. 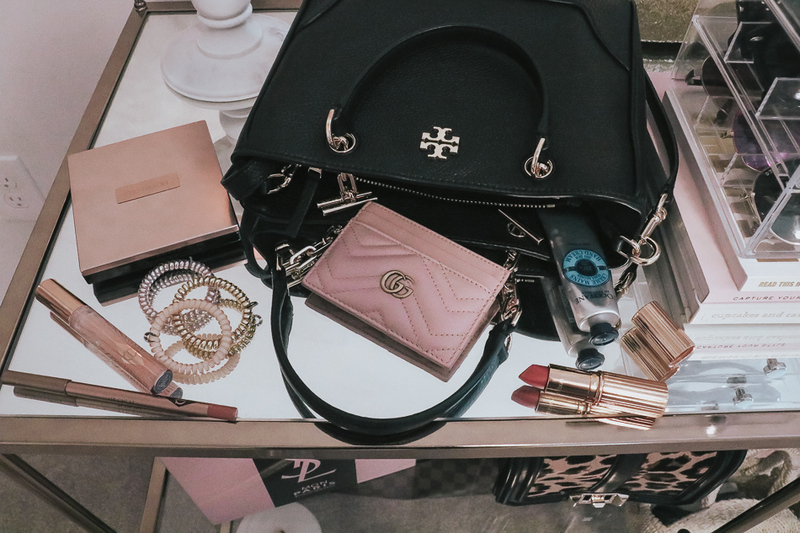 It's so easy to pop into my clutch, purse, or crossbody bag and fits just enough cards and/or cash. 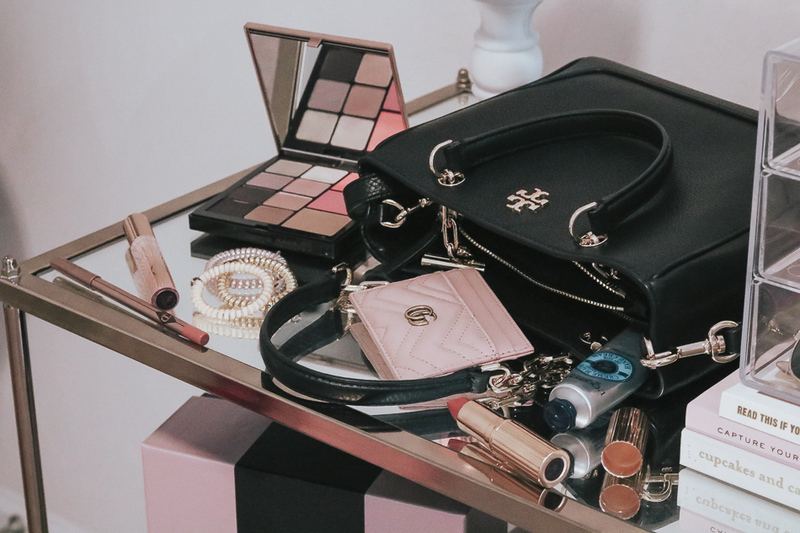 It's a small splurge but affordable in the grand scheme of all things Gucci. And very conveniently sized! 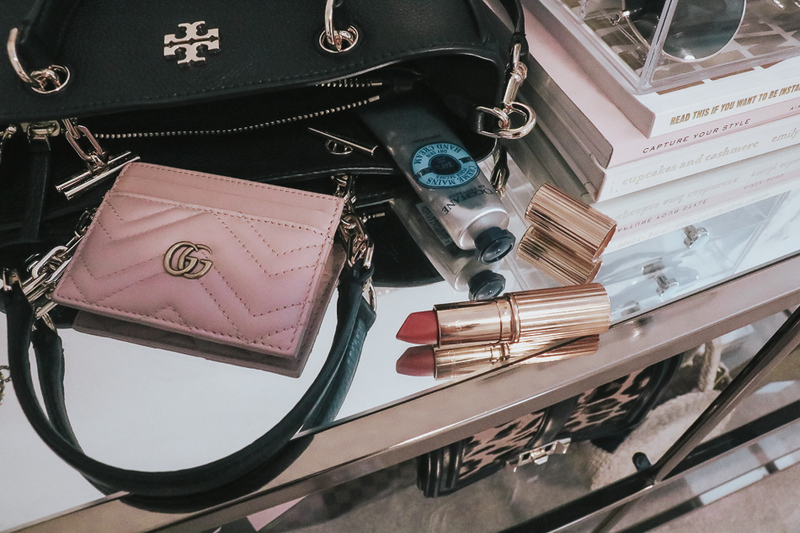 You probably already know if you read Friday's Nordstrom Sale beauty post, but I've been loving the Charlotte Tilbury lipstick Rose Kiss from the limited edition lip set. 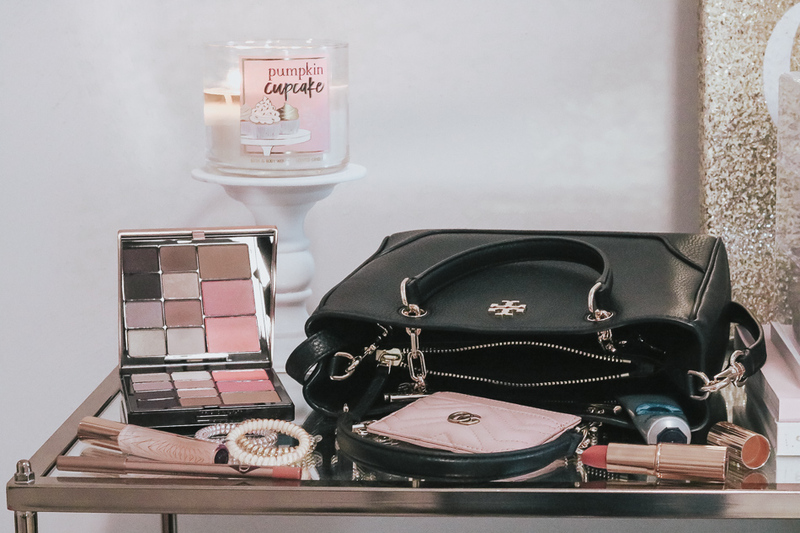 It pairs perfectly with the liner Pillowtalk (it pairs well with almost anything) and is an amazing shade for Fall. 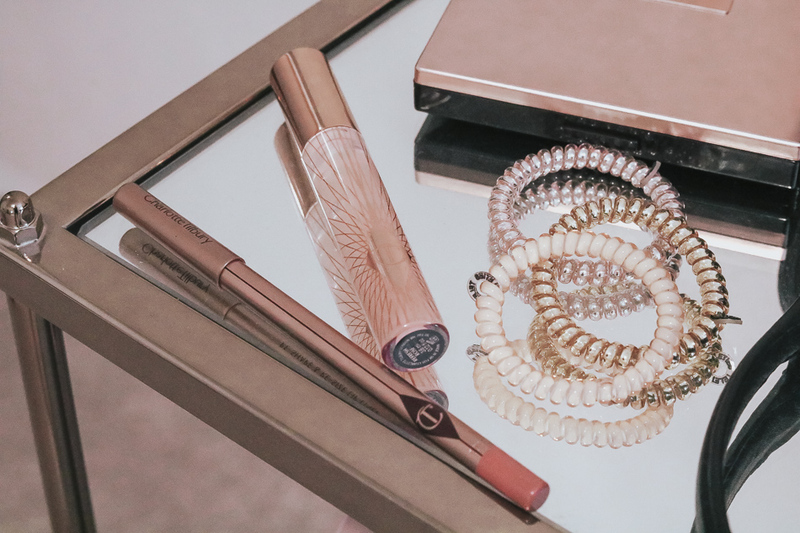 I also started using Charlotte Tilbury's Collagen Lip Bath - a gentle lip plumper - this weekend and am already obsessed. 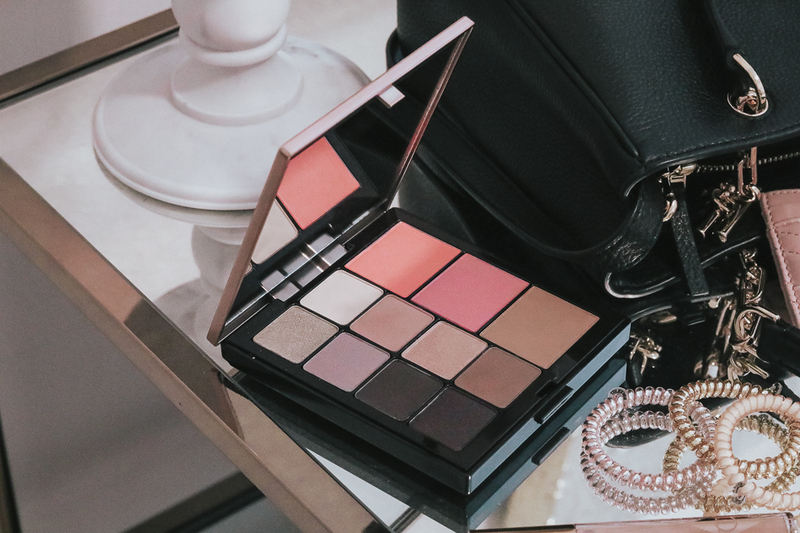 I'm also in love with Laura Mercier's anniversary sale Essentials Eye & Cheek Palette. Okay, I don't normally carry around an eyeshadow, blush & bronzer palette around in my bag lol but I wanted to show how compact this one is for travel or touch ups! The colors are nicely pigmented and the consistency of the product is fantastic. The bright pink blush in Lotus Pink is my favorite! Additionally, I almost always carry a couple plastic hair ties (I love Teleties) in my bag. I've been using these every day for Pure Barre or to get my hair out of my way now that it's getting longer. Even the thin bands hold up my thick hair and don't leave a dent. I've also had this Shea Butter Hand Cream from Loccitane in my bag ever since I received it at the RewardStyle Conference this year. A great go-to for soft hands! Lastly, my new Gucci 55mm Round Sunglasses. I've seen them go in and out of stock since the sale started and if you see them definitely consider grabbing them! I'm super pleased with the shape and the fit. They don't slide down my nose (even in hot summer temps) and the brown colorway is really flattering to many different skin tones. They are a splurge but on major sale right now until the end of the day. 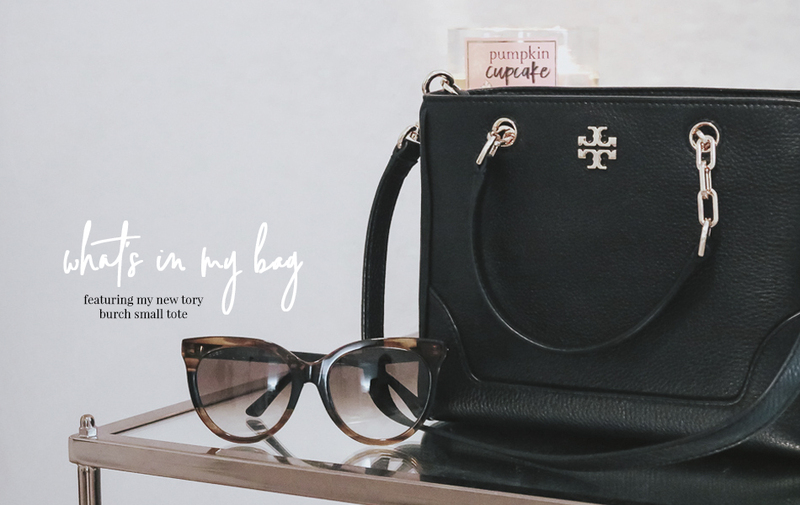 Below you can shop what's in my bag along with some other sale favs in stock!